As we face a Christmas of discontent, Ministers are, according to the Sunday Telegraph, coming under pressure from backbenchers to introduce laws to curb strikes in important public services. Which is odd really, because they already have. The Trade Union Act 2016 will require strikes on public transport to be supported by at least 40 per cent of those entitled to vote in the industrial action ballot. The relevant section is not actually in force yet, ]but the Government has published draft regulations in preparation for it coming into force in March 2017. That can’t affect current disputes, however, because the new rules can only apply to new ballots. They can’t be applied to ballots that have already taken place. In any event, you might think that it’s a little early for the Government to come under pressure to take any further action. Surely they at least want to give the 2016 Act a chance to come into force before they start on the next one? That seems to be The Government’s view. This morning the Guardian reports that No 10 is trying to distance itself from any suggestion of emergency legislation. Apart from anything else, this isn’t an emergency. A few one day strikes on a trainline in the south of England and disrupted air travel over the Christmas holidays is inconvenient if you happen to be affected. We should save the word ’emergency’ for rather more cataclysmic events. Nevertheless, the pressure from backbenchers does suggest that they don’t think that the Trade Union Act goes far enough. Or maybe there are signs that it won’t achieve the result they were hoping for. So all of these ballots would meet the standard imposed by the Trade Union Act 2016. I can’t find the turnout figure for the Unite / Swissport ballot, but 62 per cent of those voting, voted yes so it would only take a turnout of about 67 per cent to meet the Trade union Act threshold. If the point of the Act is to ensure that industrial action has proper democratic support, then surely these figures should be welcomed? 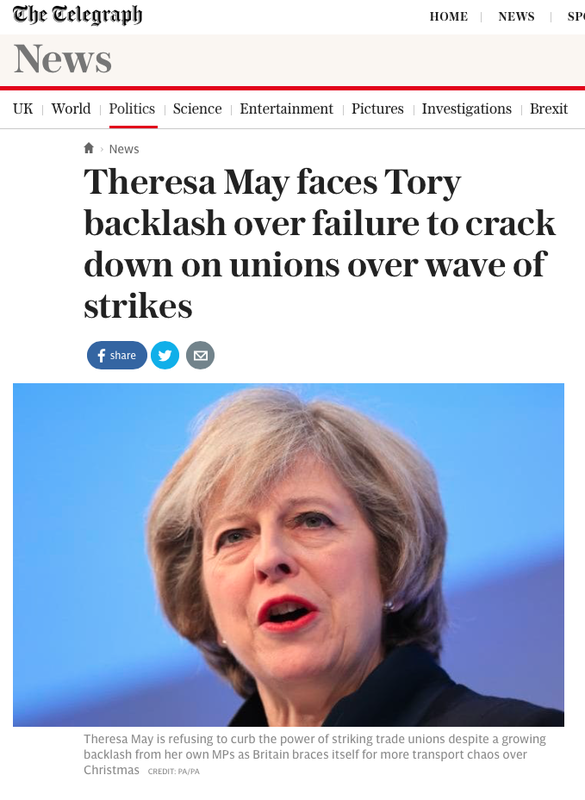 Shouldn’t we say – ‘well its all very inconvenient, but its clear that this action has the support of union members, so perhaps the two sides just need to get together and reach a settlement? 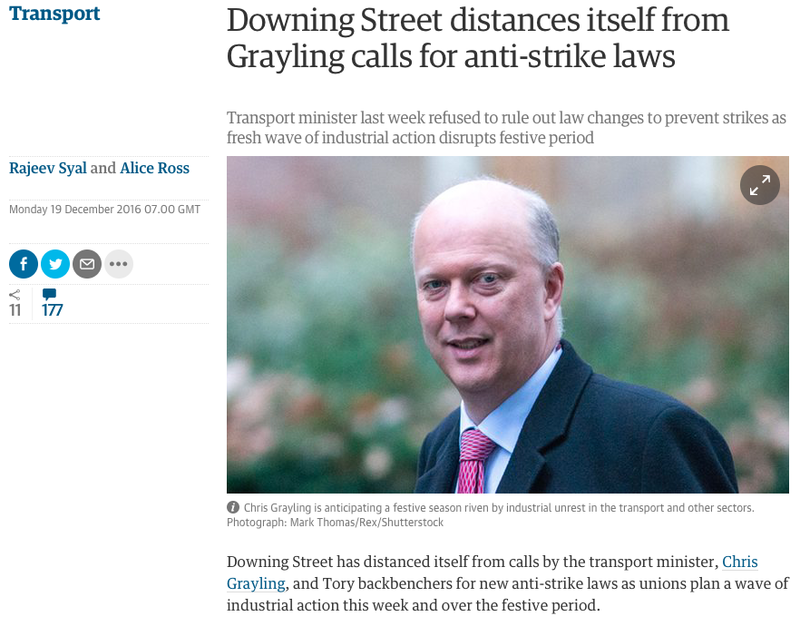 “it is, unfortunately, a lawful strike’. Dozens of Tory MPs favour tougher rules which would bar unions that represent “critical” industries from calling strikes unless they are “proportionate”. Many also want a “minimal requirement” that would force unions to run at least half of all usual services even when they are striking. This gets us into the deep waters of international law – and that may be why the Government currently seems to be resisting the calls for further reform. Banning strike action in essential public services is common practice across the world and well established. After all, the police cannot go on strike and neither can the army. But the International Labour Organisation has always taken a rather strict view of what counts as an essential public service, limiting it to those services the “interruption of which would endanger the life, personal safety or health of the whole or part of the population”. It’s a struggle to see train drivers or baggage handlers being squeezed into that category. I don’t think such limited measures are quite what those agitating for new restrictions have in mind. Of course, the last Conservative Government was unconcerned by complaints that the UK was failing to comply with ILO conventions. But then, the last Government was not just about to leave the EU and face the prospect of the UK becoming a stand-alone member of the World Trade Association. The WTO has affirmed the importance of core labour standards and recognises the ILO as the appropriate body for determining what they are. If we run into trouble with the ILO there would be a clear risk of that spilling over into a dispute about our position in the WTO and that could turn into a very big deal indeed. Leaving the EU does not mean we can simply ignore international standards – not if we want to trade with the rest of the world. I think the Government knows that it needs to steer clear of this whole area until the dust from Brexit has settled. Meanwhile, if you’re travelling the Christmas, comfort yourself that any disruption has more democratic support that our decision to leave the EU. This entry was posted in BREXIT, Industrial action, Trade Union Bill and tagged Chris Grayling, christmas travel chaos, ILO, strikes, UNiITE, WTO. Bookmark the permalink.